Back in 1781, Mozart wandered into Vienna’s Deutschordenshaus, where his boss (the Archbishop of Salzburg) was staying, argued a little a lot, and eventually got fired. He decided to stay in the city as a freelance composer, musician, and teacher, and so a legendary partnership began…Mozart and Vienna, which go together like Beethoven and Vienna. Or Schubert and…, well, you get the message. It truly is a city of music. Use the map below, photos, notes, links, and more for a Mozartean meander through the streets of Vienna to the places he lived and performed in, and to the many memorials to his genius. Oh, and if you want to hear his music played live in historic surrounds, try these concert tips. And if you want to visit Salzburg (his birthplace), you can easily take a day trip from Vienna. All the locations shown on the map are described below. Places where Mozart lived or performed, but the buildings no longer exist, are not given on the map at all unless there is a plaque or similar there to see. If you only have limited time, then the following sites are the must-see items on your Vienna to-do list. The Mozart monument (Burggarten, Burgring): A large statue erected in 1896 and moved to the Burggarten park in 1953. It’s one of Vienna’s best photo motifs, thanks to the musical symbol written out in flowers in front of the monument. More details here. Mozarthaus (Domgasse 5): Museum dedicated to his time in Vienna and his music, with a changing exhibition, too. Occupies two floors above the Mozartwohnung (see below). The area around the museum looks pretty much like it did in the late 1700s. More details here. Mozartwohnung (Domgasse 5): Mozart’s actual apartment between 1784 and 1787, returned to its original structural condition and open to the public. More details here. Mozart’s grave (Leberstraße 6-8): Contrary to legend, he wasn’t dumped in some pauper’s mass grave, but it was an unmarked one. However, there is a memorial on the grave’s most likely location in St. Marx cemetery. More details here. The Mozart memorial (Simmeringer Hauptstraße 234): The first memorial at the site of the St. Marx grave was moved to the Zentralfriedhof cemetery in 1891 to join the group of famous composers buried there. More details here. Stephansdom (Stephansplatz): St Stephen’s cathedral really fulfilled the “births, deaths and marriages” role when it came to Mozart. Two of his children were baptised here. On his death, his body was blessed here and a Requiem held. And he married Constanze Weber here on August 4th, 1782. There’s a plaque on the wall inside the cathedral commemorating these events (on the south side, next to the Katharinenkapelle). The Mozartwohnung is the only one of Mozart’s residences that is more or less unchanged. As mentioned earlier, many have been destroyed, others altered beyond recognition. These are the ones I think are still the same building (but no promises!). Weihburggasse 3: Mozart lived here on a visit to Vienna in the autumn of 1767. It’s now the Hotel Kaiserin Elisabeth. He’s not the only prominent musical guest to grace the corridors of the building. Others include Franz Liszt, Richard Wagner, Anton Bruckner, and Eduard Grieg. Tiefer Graben 18: Stayed here for three months in 1773 on another visit to Vienna with his father. It was here that he wrote, for example, the incidental music to Thamos, King of Egypt. There’s a plaque outside the building, which is now the Hotel Das Tigra. Singerstraße 7: The Deutschordenshaus where Mozart stayed in 1781, in service to the Archbishop of Salzburg. This is where the quarrels took place that led to his eventual dismissal and decision to go solo in Vienna (luckily for us). A few years later he’d be living in a rather fine apartment within spitting distance – the Mozartwohnung. Milchgasse 1: His first address after leaving the Archbishop’s service. A plaque outside the house says he lived in the building and wrote Die Entführung aus dem Serail there. However, the style of the house suggests it might be too young to be the original, though. I’m not sure. Kohlmarkt 7: He lived here for a few weeks in 1783. It’s a remarkably handy address for the Habsburg palace (almost next door). Judenplatz 3-4: He also lived here in 1783. The original building is no more, but there is a nice plaque mentioning the location’s Mozartean history, put up by the innkeeper’s cooperative in 1929. The location is now the home of the restauranteur section of the Viennese Chamber of Commerce. The building across the square is still from Mozart’s time. Währinger Straße 26: Not the original building, but there is a plaque above the entrance describing how Mozart wrote Cosi fan tutte and other pieces in the “Garden House” on this site around 1788. Schönbrunn Palace and Orangery (Schönbrunner Schloßstraße 47): The summer palace of the Habsburgs witnessed a couple of legendary Mozart moments. On the palace tour, you can see the room where a young Mozart first performed for Empress Maria Theresia. In the Orangery (which still holds public concerts), Mozart and Salieri duelled it out musically at the behest of Emperor Joseph II. Salieri’s Italian opera went up against Mozart’s German Singspiel, both competing for the attention of the assembled guests. Salieri won. Palais Collalto (Am Hof 13): A plaque outside reveals that Mozart gave his very first public performance in Vienna in this Palais in 1762 (he must have been about six years old). Waisenhauskirche (Rennweg 91): A 12-year-old Mozart wrote the Mass in C minor (the “Waisenhausmesse”) for the church’s consecration in 1768, and led the performance himself. Known as the “Orphanage church” (Waisenhaus – Kirche), but is actually the Parish Church “Maria Geburt”. Augartensaal (Obere Augartenstraße 1): A regular venue for entertainments in the Augarten park in the late 18th and early 19th century. Mozart performed his Piano Concerto No. 10 in the Augartensaal in 1782. Palais Auersberg (Auerspergstraße 1): Mozart led a private performance of his Idomeneo opera here in 1786. This Baroque palace is a popular venue for exhibitions, fairs etc. and still hosts classical music concerts. Haydnhaus (Haydngasse 19): An honourable mention to the home of Joseph Haydn, who often visited Mozart. It’s now a museum. Café Mozart (Albertinaplatz 2): The first coffee house on this spot dates back to 1794, just three years after Mozart’s death. It received its current name in 1929, in honour of the Mozart monument then located opposite. The Maria Theresa monument: Put up in 1888 to honour the great Empress of the 18th century. One side of the huge plinth highlights personalities from science and art – a statue of a young Mozart stands just below Haydn. More details here. The Mozart fountain (Mozartplatz): Built in 1905 and also known as the Magic Flute fountain, since it depicts a scene from the opera. Papagenotor (Millöckergasse/Papagenogasse): Stone figures above a gateway show Papageno from The Magic Flute, created in honour of Emanuel Schikaneder. He wrote the opera’s libretto and founded the concert/opera house the gateway leads into. More details here. Paminagasse / Taminoweg / Sarastroweg / Papagenogasse: All streets named after characters from the opera, The Magic Flute. 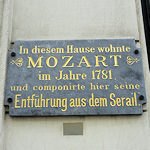 Mozartgasse: Both the street and the square at its centre (Mozartplatz) were renamed in his honour. The Mozart star (Linke Wienzeile 6): A Hollywood walk-of-fame style star in front of the Theater an der Wien. It was not in the best of conditions when I visited.